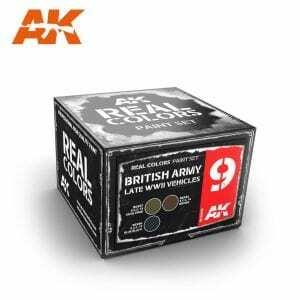 This set contains the three camouflage colors used for painting vehicles deployed by the British Army in Europe from April 1944 until the end of the WWII. Included are the S.C.C. 15 Olive Drab used as the base color, and S.C.C. 1A Brown and S.C.C. 14 Blue Black colors that had been used for applying disruptive patterns. Our Real Colors are the highest quality acrylic lacquer paints, made from an improved chemical formula over other brands in the market. They spray smoothly through an airbrush; adhere to the surface and dry perfectly with a soft matt finish. These paints hold firmly all kind of weathering products. 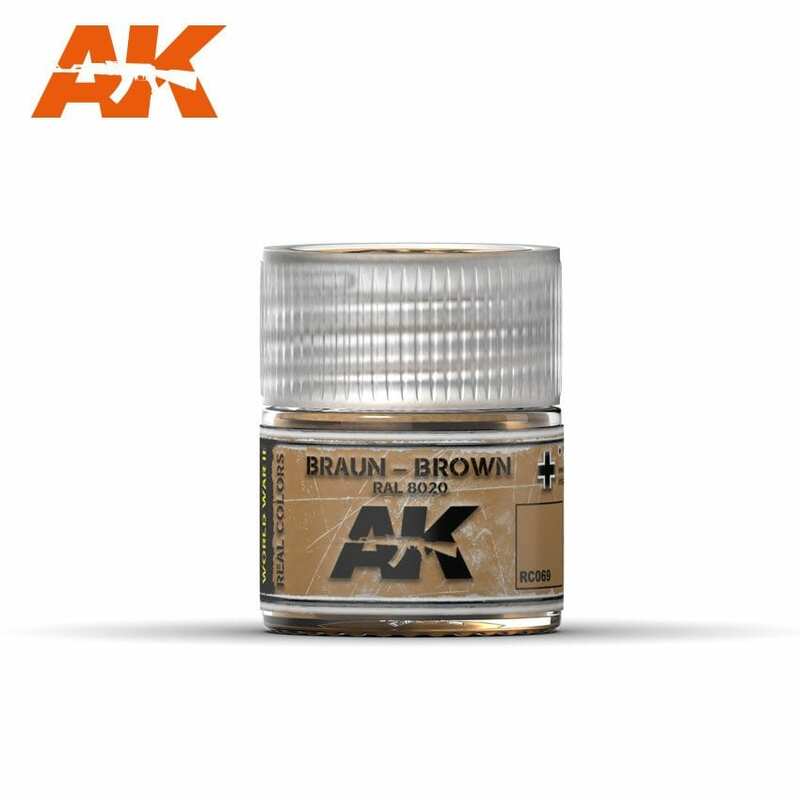 They may be diluted with AK-Interactive’s specific thinner, or thinners from other manufacturers intended for acrylic lacquer paints (non-vinyl). They may also be easily mixed with other acrylic lacquer paints. Real Colors accurately reproduce the original colors. 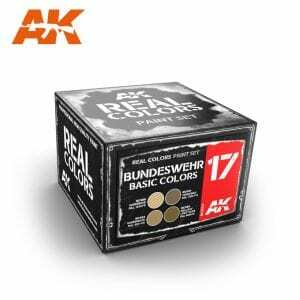 This set contains the four camouflage colors that are most commonly used for painting vehicles operated by the Bundeswehr (German Army) in the desert environment. This mainly concerns the equipment of the German ISAF Contingent in Afghanistan. 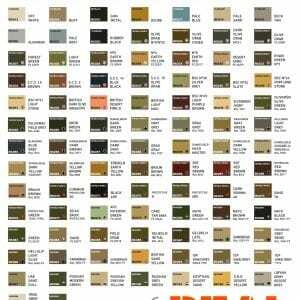 Included are: RAL 1039-F9 Sandbeige, RAL 6040-F9 Helloliv, RAL 7050-F9 Tarngrau, and RAL 8031-F9 Sandbraun. Our Real Colors are the highest quality acrylic lacquer paints, made from an improved chemical formula over other brands in the market. They spray smoothly through an airbrush; adhere to the surface and dry perfectly with a soft matt finish. These paints hold firmly all kind of weathering products. 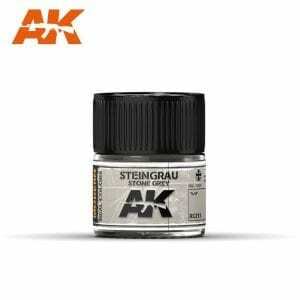 They may be diluted with AK-Interactive’s specific thinner, or thinners from other manufacturers intended for acrylic lacquer paints (non-vinyl). They may also be easily mixed with other acrylic lacquer paints. Real Colors accurately reproduce the original colors. This set contains the two variants of the basic camouflage color of the Bundeswehr (German Army) vehicles used from 1950s until 1980s, the RAL 6014 Gelboliv. Also included is the fifth camouflage color used for painting vehicles of the German ISAF Contingent in Afghanistan, the RAL 1040F-9 Graubeige. Our Real Colors are the highest quality acrylic lacquer paints, made from an improved chemical formula over other brands in the market. They spray smoothly through an airbrush; adhere to the surface and dry perfectly with a soft matt finish. These paints hold firmly all kind of weathering products. They may be diluted with AK-Interactive’s specific thinner, or thinners from other manufacturers intended for acrylic lacquer paints (non-vinyl). They may also be easily mixed with other acrylic lacquer paints. Real Colors accurately reproduce the original colors. This set contains the four camouflage colors that had been most commonly used for painting vehicles deployed by the British Army in North Africa from autumn 1942 until spring 1943. Included are: British Desert Pink ZI, British Dark Olive Green PFI, BSC No.61 Light Stone and S.C.C. 14 Blue Black. Our Real Colors are the highest quality acrylic lacquer paints, made from an improved chemical formula over other brands in the market. They spray smoothly through an airbrush; adhere to the surface and dry perfectly with a soft matt finish. These paints hold firmly all kind of weathering products. They may be diluted with AK-Interactive’s specific thinner, or thinners from other manufacturers intended for acrylic lacquer paints (non-vinyl). They may also be easily mixed with other acrylic lacquer paints. Real Colors accurately reproduce the original colors. 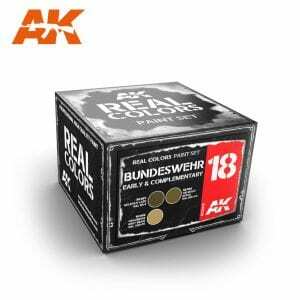 This set contains the four colors that are essential for painting the interiors of models of vehicles used by the German Army during WWII. Included are: RAL 1001 Elfenbein (Ivory), RAL 7009 Hellgrau (Light Grey), RAL 8012 Rotbraun (Red Brown) and RAL 8013 Rotbraun (Red Brown). Our Real Colors are the highest quality acrylic lacquer paints, made from an improved chemical formula over other brands in the market. They spray smoothly through an airbrush; adhere to the surface and dry perfectly with a soft matt finish. These paints hold firmly all kind of weathering products. They may be diluted with AK-Interactive’s specific thinner, or thinners from other manufacturers intended for acrylic lacquer paints (non-vinyl). They may also be easily mixed with other acrylic lacquer paints. Real Colors accurately reproduce the original colors.